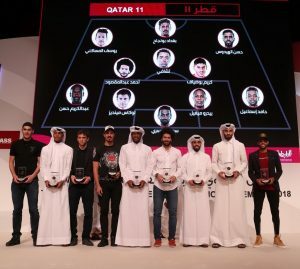 Qatar11 is an annual award from the players for the players, where Qatar Players Association invites all professional footballers to choose the best eleven players who constitute the best team of the season. This award was designed based on FIFA FIFPRO WORLS XI in which all professional footballers around the world vote to choose the best team of the year. This recognition is considered unique because its by the players where they would vote for a goalkeeper, four defenders, four midfielders and two strikers. Qatar Players Association seeks to enhance the sport spirit and solidarity through Qatar 11 awards and it hosted its first edition in 2018. Best Goalkeeper: Saad Al Dosari – Al-Sadd Club. Best Right Back: Hamid Ismail – Al-Sadd Club. Best Left Back: Abdulkareem Hassan – Al-Sadd Club. Best Central Defender: Pedro Miguel – Al-Sadd Club. Best Central Defender: Lucas Mendes – Al-Duhail Club. Best Central Midfielder: Karim Boudiaf- Al-Duhail Club. Best Central Midfielder: Ahmed Abdulmaqsoud – Al-Rayyan Club. Best Attacking Midfielder: Xavi Hernandes – Al-Sadd Club. Best Right Wing: Hassan Al Haydos- Al-Sadd Club. Best Left Wing: Youssef Msakni- Al-Duhail Club. Best Striker: Bagdad Bounjah- Al-Sadd Club. The form contains three names for each position based on the valuation of Qatar Stars League. The players are not obliged to choose from the names in the form and they can add any name of their choice. One player should be chosen for each position. The form should contain the players’ name and signature. By the end of the voting process, Qatar Players Association would announce a shortlist of the three names of each position who collected the most votes and will announce the winner during the ceremony of Qatar11.